Buster Keaton's College is a note-perfect send-up of university comedies, and in a funny way, an early critique of how motion pictures so regularly hire older adults to play young ones. Old Stone Face as a new high school graduate? It's a great sight gag, that's to be sure, and only the beginning of what is a very funny silent film. College was released in 1927 at a time when higher education stories were trendy. Keaton, who is believed to have done most of the directing on this picture in addition to starring, plays an uber-smart student who finds himself in hot water for his intellectually pompous anti-sports philosophy. His high school sweetheart (Anne Cornwall) rejects her suitor until he can learn to stop being so stuck-up. Devastated, the newly jilted scholar decides if he can't beat 'em, he's gonna join 'em. He follows the girl, as well as the athlete who is his rival for her affections (Harold Goodwin), to the fictional Clayton College. There, he hopes to get on one of the school's teams. It doesn't matter which sport, because he doesn't know how to play any of them. In College, plot is secondary to comedy. What exists here exists merely to set up Keaton for another pratfall. There are two basic scenarios: either Buster screwing up on one of the jobs he gets to pay for tuition, or him making a jerk of himself on the field. He tries out for baseball and track before ultimately ending up on the rowing team. He works as a soda jerk and also a waiter--the latter in ill-advised blackface. And not ill advised from a modern PC standpoint, but his ruse gets him into trouble in the film itself when his co-workers find out that he's faking. It's the essential Buster Keaton m.o. : bad choices lead to hilarious consequences. All of College's scenarios are very funny, and the laughs make up for the lack of a more complicated story and characterization. Each new locale or task gives the great performer something fresh to play with. He is endlessly inventive, working every possible angle of the situation, be it the showy acrobatics of making an ice cream soda or the literal acrobatics on the track course. The funniest jokes come early, however, at Buster's high school graduation. A heavy downpour has caused his new suit to shrink--while he's wearing it and while he's delivering his doomed valedictorian speech. Keaton plays it perfectly, employing his usual deadpan distress to earn big laughs. 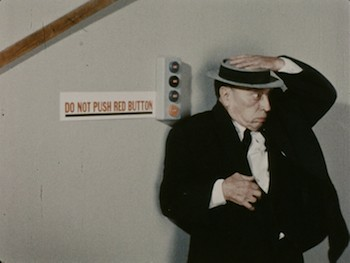 In the last couple of years, Kino has undertaken a massive restoration project and re-released the Buster Keaton catalogue as remastered editions, both as standard-definition DVDs and high-definition Blu-Rays. College comes on the heels of a huge boxed set released just before Christmas, and just like its siblings in that set, it has been scrubbed from top to bottom. While there is still some unavoidable print damage at times, the overall look of the College: Ultimate Edition DVD is fantastic. The resolution is sharp and even when there are scratches evident on screen, the image is always visible and clear. The black-and-white photography is nicely balanced, never too dark and also never washed out. College is shown in its original full frame 1.33:1 aspect ratio. John Muri provides musical accompaniment for this silent comedy, and he does a nice job working with the movie. Working with a multi-faceted orchestra, Muri keeps the merriment going without ever overdoing it. 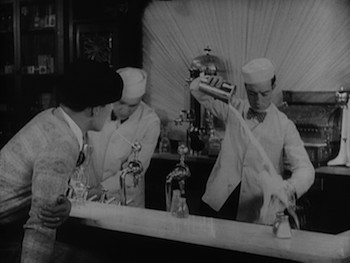 The music is there to move the action along, but Muri holds back so that he's never telegraphing the joke or somehow selling the slapstick instead of Keaton. The audio is in 2.0 stereo. The film contains the original title cards from the 1927 release. 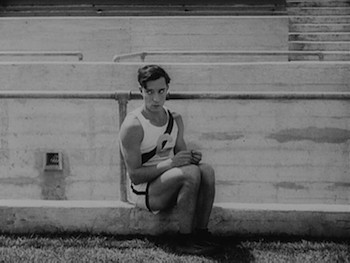 Film scholar and slapstick expert Rob Farr provides an audio commentary to go alongside College, informing us of the history of the production, explaining its significance as both a Buster Keaton film and as a record of athletics of late 1920s. 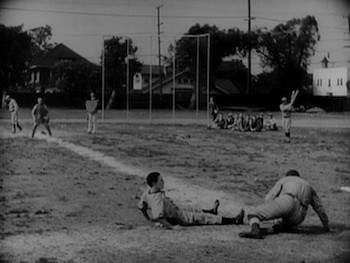 As it turns out, many of the featured actors were actually well-known athletes. Adding to this is John Bengston's visual essay highlighting College's shooting locations. 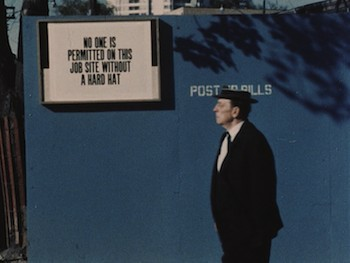 The main bonus feature is the inclusion of a 1966 short film, The Scribe. 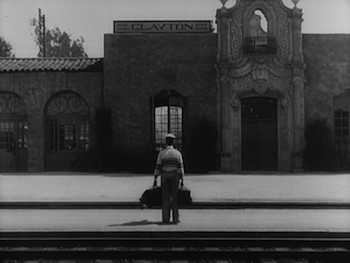 This movie is Buster Keaton's last performance on film. The half-hour program is an industrial short made for the Construction Safety Associations of Ontario and is in color. The actor plays a reporter sent to a building site to do a story on construction safety. Once there, he bumbles his way into demonstrations of different rules and regulations. Keaton was still capable of giving a solid performance, albeit a more self-conscious one--he never speaks, despite The Scribe being a talkie. It's also kind of sad seeing him reduced to being a mere functionary in this kind of production. Highly Recommended. Another fine entry for Buster Keaton is also another fine release in Kino's Keaton library. The College: Ultimate Edition upgrade dusts off the 1927 silent, remastering the whole thing in HD from original 35mm archives, to showcase this sports-based comedy for the 21st Century. Since College starred Keaton at his peak, it's no surprise that it's incredibly funny. College is a slapstick classic and a worthy addition to any home video library.